MedEdPortal, a division of AAMC, just released this healthcare simulation curriculum and assessment tool for those teaching patient handoffs to medical students in OB/GYN. You must be a subscriber to the website to get the full toolkit. Patient handoffs, the communications required for the safe transfer of patient care, are known to be a common source of medical errors. Simulation exercises are effective techniques for teaching the procedures and patient interaction skills involved in a handoff. We developed a teaching tool that allows students to individually interact with a simulated patient, develop a treatment plan, and practice a handoff to another provider. 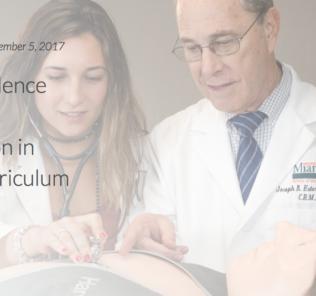 The curriculum is a flexible instructional tool to teach patient handoffs in the context of a simulated obstetric emergency for learners at the clerkship through first-year obstetrics and gynecology resident levels. The curriculum secondarily teaches management of first-trimester bleeding with acute blood loss and can be adapted to allow advanced learners to practice obtaining informed consent. To evaluate this simulation for educational effectiveness, we developed a faculty observation assessment tool. The simulation assessments for history taking, fund of knowledge, and interpersonal skills were predictive of subsequent clerkship clinical grades. Eighty percent of students agreed the exercise was realistic, 95% agreed it was relevant to the clinical curriculum, 90% agreed the simulation taught handoff skills, and 73% agreed the simulation increased confidence in handoff skills. Students uniformly found the curriculum to be relevant, realistic, and effective at teaching handoff skills. Use of this curriculum has the potential to improve students’ communication skills, handoff performance, and confidence during an obstetrics and gynecology clerkship. The assessment tool may allow early identification of students in need of improvement in communication skills. Read the full article and get the toolset here on MedEdPortal!